Can Procion MX colour dyes be applied to dry cotton? With Procion MX colour dyes can this be applied to dry cotton? The reason I ask this is because I would like to use the dye to draw on to the cotton. Nothing fancy but just simple? I am more thinking that you cannot because the cloth needs to be damp in-order for the procion to be permanently applied? I know I could probably still achieve this but just worried about the dye kind of blotting when applied to the wet cloth? In this case, which type of dye could I use to achieve this? I would prefer something that like soaks into the shirt like the above dye. You can use Procion MX dyes to draw or paint on dry fabric. As always, you will need to use soda ash or another high-pH fixative, but there is more than one way to do this. One method is to mix up your Procion dyes as usual, then place just enough for you to use up within an hour into another container. In this smaller container, dissolve one-half teaspoon (2.5 milliliters) of dry soda ash in one cup (250 milliliters) of dye solution. After an hour, throw away any that remains of this activated dye, and dissolve soda ash in a fresh batch of the dye. The dye itself will stay good for at least a week at room temperature WITHOUT soda ash, but as soon as the soda ash is added, it starts to go bad, so you need to mix only enough to use right away. Another method is to soak your dry cotton fabric in soda ash, as usual, then take it out of the soda ash mixture, let it drip, and hang it up to dry. As it dries, the soda ash will stay in the fabric, ready to react with the liquid dye as it comes into contact with it. Be careful that you do not put your pen or paintbrush into the main container of dye color that you have mixed up, because some soda ash will inevitably be transferred from your brush to your dye container, and shorten its lifespan dramatically. Just pour out enough to work with for a while, throw it out within an hour, and then pour out a fresh amount to continue painting. Be careful when handling the dry fabric that has soda ash in it, because the soda ash is irritating to your hands, and, if it dusts up into the air, it is irritating to the lungs to breathe it. Wear gloves or a dust mask if needed. A third method is to skip the soda ash, and paint your Procion MX dye liquid onto the fabric, then let it dry. After it is dry, you can paint on a liquid for of sodium silicate, which is also called Water Glass. The sodium silicate has a high pH and works as a fixative just the same way that soda ash does. As soon as you are done painting, cover with plastic wrap to keep it from drying out in the fabric. Do not allow sodium silicate to dry in fabric! It will be too difficult to wash out. Be careful not to get water glass on your skin or onto any glass or furniture. It is best to wear safety glasses in case it spatters. For more info on using silicate to fix Procion MX dyes, see my page, “Sodium silicate as a fixative for dyeing”. Sometimes dyers place the soda ash, dissolved in water, into a spray bottle, and use it to spray onto the dry Procion MX painting. This can work well, but of course the dye lines on the fabric may soften and get wider. Another method is to place the soda ash mixture in a basin, and dissolve as much salt as can be dissolved in it, so much that a little salt remains at the bottom of the container. This saturated salt solution reduces the solubility of the dyes, so that they spread less when the fabric is dipped into it. Using a soda ash/saturated salt solution for spraying may help. You should expect some dye movement, however. When using any of these techniques, be sure to try it on a quick test project, before using it on a complex piece that has taken you time to make. Testing your methods is always important. It would be sad to make a complex beautiful painting and then see it smeared by the fixation step. For more information on using soda ash for fixing dye, see my page, “What is soda ash, and what’s it used for in dyeing?”. This entry was posted in dye application, dye painting on January 23, 2015 by pburch. Can you share the best method for removing color from an old wool rug? Can you share the best method for removing color from an old wool rug? Thiox seems to only remove the color on a few random spots, not all over. 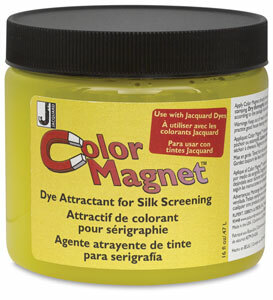 Jacquard Color Remover removes dye and stains and whitens fabric. Contains thiourea dioxide and soda ash. Must be used with hot water. I’m afraid that there is no product that will work better than the one you’ve tried. There are two problems with trying to remove the color from an old wool rug. One is that not all dyes can be removed at all. The other is that you can only remove the dye that you can reach. If the dye is covered with invisible dirt, spilled oil, spilled wax, stain-resistant spray, or just about anything else, the dye will be protected from any chemical you try to treat it with. You have to get the rug very, very clean in order to access the dye, but some stains are impractical or impossible to remove. Even if you get all dirt and other coatings off of the rug, though, there’s no great likelihood of removing all of the dye. Whether you can remove any of the dye depends on what specific dye it is. You can never tell what dye was used on a commercial product, though; even if you know with one item, an identical item from the exact same suppliers may be dyed with a non-removable dye the next time. Some dyes can be removed easily with a reductive discharge chemical such as thiox; some can be removed by an oxidative discharge such as bleach; some can be removed with either; but some dyes cannot be removed with any chemical you try, no matter what you do. In some cases, you can destroy your fabric, leaving it in rags, and still have color in it. Wool is easily damaged by high pH. Like your hair, wool requires mildly acid conditions, to protect it. A high pH may lead to obvious damage or to felting. Most color removers are used at a high pH (alkaline or basic), instead of an acid pH. Thiox, which is a brand name for thiourea dioxide, is an excellent color remover, but you do have to be careful not to damage wool when using it, due to the high pH of recipes that call for thiox. PRO Chemical & Dye provides instructions for using thiox to remove dye from cotton, silk, or wool, which also call for soda ash, resulting in a high pH; see their page, “Thiox: Thiourea Dioxide”. Note that recipes for thiox require quite a bit of heat, heating the discharge bath to at least 175 degrees F (79 degrees C); if you used thiox in cooler water, you might find that you have better results with the right temperature. Be sure to neutralize the soda ash in the wool by rinsing with a mixture of vinegar in water afterwards. Other reductive-type color removers, such as the sodium hydrosulfite in Rit Color Remover, or sodium hydroxymethanesulfinate, which is sold under the name Formosul, will not produce significantly different results than thiox. Formosul is generally considered the best choice for removing color from wool, because it can be used at a nice gentle acid pH, but it will not do a better job than the thiox you tried already, assuming that you used a good recipe for the thiox, and enough heat. PRO Chemical & Dye’s recipe for using Formosul shows the use of citric acid instead of the soda ash used with other discharge chemicals. As you probably already know, oxidative bleaches, such as the hypochlorite in chlorine bleach, will damage wool much worse than the reductive discharges such as thiox or formosul. I strongly recommend against even trying it. Chlorine bleach is good only for natural cellulose fibers, such as cotton, linen, or hemp. 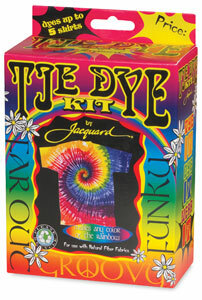 For more info on dye removal, please see my page, “What chemicals can be used to remove dye?”. This entry was posted in discharge and bleach on January 20, 2015 by pburch.